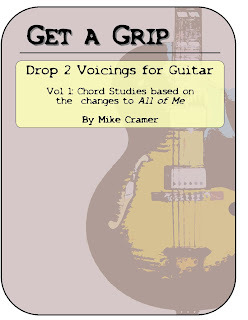 I'm excited to tell everyone about my new instructional book, Get a Grip: Drop 2 Voicings for Guitar. If you're looking to gain a deeper understanding of chords and increase your chord vocabulary this book can help. The first section of the book presents the theory behind the Drop 2 concept along with several diagrams for 7th, 9th, and 13th chords. The second section applies the theory by presenting several ways to voice the chords to the jazz standard All of Me. The book is available as an instant download. This ebook is a pdf, so you will need the Adobe Reader or any other pdf viewer.